You are currently browsing the tag archive for the ‘TJ Hart’ tag. Levi Page has been regularly appearing on Issues with Jane Velez-Metchell during their latest coverage of Haleigh Cummings. For such a young guy, this is quite an accomplishment. Some would say that Simon has finally abandoned the little girl. Something that Barrett has ad nauseum repeatedly said that he would never do: Give up on Haleigh. One thing is for sure; Levi Page had absolutely no trouble broadcasting a good show on Haleigh last Sunday. 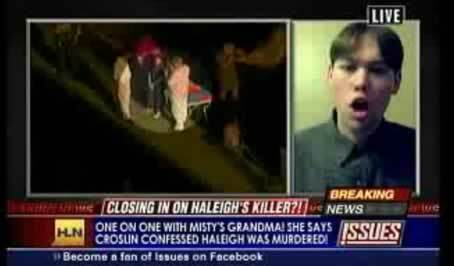 Levi Page’s latest Blog Talk Radio show ran a 40-minute segment on what was going on in the Haleigh Cummings tragedy. I found his segment on the recent doings of Leonard Padilla most revealing. LE has mailed DVDs of Misty Croslin’s and Ronald Cummings’ alleged drug-dealing ways to the nationally televised Nancy Grace show as well as to other media outlets. Yet, the availability of these drug videos still remains rather scarce.